Books of the Week – Don Freeman | Tired, Need Sleep. Recently we picked up Dandelion at the library. We both enjoyed this book about being authentic and not worrying too much about appearances. “Be who you are” books are always a big hit around here. :) I didn’t realize until later that it was also written by Don Freeman! Then Vanessa, over at Silly Eagle Books mentioned Beady Bear , also by Don Freeman in this blog post. Of course we had to find it! It’s an adorable story of another toy bear and his silly experiment in living like a real bear. 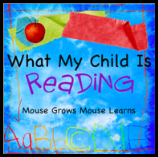 For more book reviews, check out Natalie’s blog carnival at Mouse Grows, Mouse Learns! I love these books! Dandelion is a childhood favorite. Thanks for reminding me about it. All these books look like ones I am going to have to look into. They sound like books that Selena would enjoy. Thanks for joining WMCIR. I didn't know that Freeman had so many other good books. I will make sure to try and find them in our library. We read Corduroy this week, too. He's so sweet! I forgot about the Corduroy Book! It used to be one of my favorites! So glad you found Beady Bear and Earl the Squirrel is one of my favorites, too. You'll have to look for a copy of There's a Canary in the Library--it's my very favorite of his books (of the ones we've read so far.) Juliet really loves A Pocket for Corduroy, too. We love Don Freeman too! We must have read Dandelion a million times when he had it from the library. We love Earl the Squirrel, too, and we own Corduroy and read it often.There's another called Norman the Doorman, I think, about a mouse who lives in an art museum. Since you guys seem to love all the same books we do, have you come across David McPhail yet? (I think it's David, I know it's McPhail). He is our current favorite. There are tons of them, all very different, but we love them all.